These paintings are part of a much larger body of work using the circle. 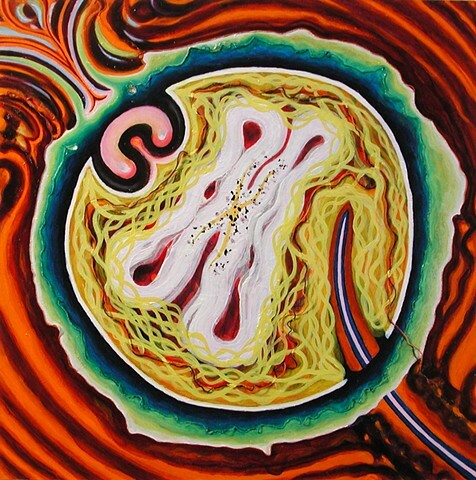 The motif refers to inside/outside; self/other; the dream, the dreamer, and the dreamed; the power of wholeness; the simplicity and purity of children’s art; the Buddhist concept of sangha; the self and its relationships; coincidence of macro, micro, and human; the manifestation of form and sound; the transformation of thought and dross into something more. They are not maps per se, they are the result of my contemplation of ideas and feelings put into a visual form. I use those elements of form, color, texture, perception, and consciousness to create a very intimate picture or painting of me in my dream. The painting is the intention of me. My painting reflects some of Joan Miro, Alexander Calder, Paul Klee, Brice Marden. There are constellations and star maps and bio-luminescence. There is a visual search for the first sound. There is humor and pathos in our human interactions. There is a personal relationship with the Other, and the manifestation of that interbeing. The separation of me from all the rest is only a product of my attention and intention. There is a sense of universality and of the absolute in the form of the circle. The square of the canvas is a despot. The circle refers to itself. There are elements of chance, fixed parts, and parts unformed except from what they are not. There are layers, and there are parts that are flat and simple. Movement and stillness. Formal and casual (causal?). Abstract and emotional. They are not explorations of duality, but rather celebrations of unity. I seem to be drawn to images from astronomy: the vastness of space, the nature of stardust, and the immediacy of light. Koo koo ka choo.